Elliott Teaford: The Anaheim Ducks have put Patrick Eaves on the IR with flu-like symptoms. Craig Morgan: Arizona Coyotes forward Mario Kempe suffered an upper-body injury and is listed as day-to-day. Other injured Coyotes centers include Christian Dvorak, Brad Richardson and Nick Schmaltz. 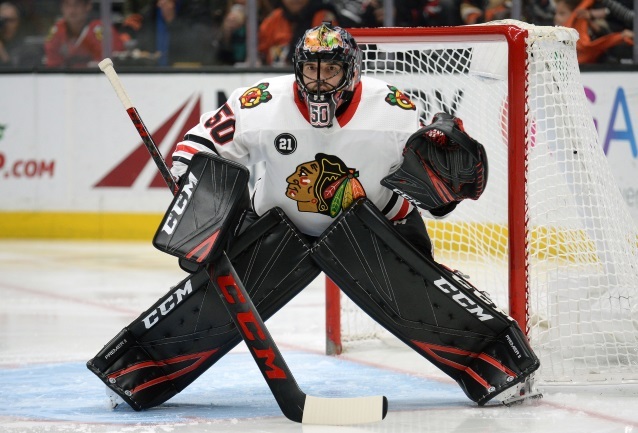 Mark Lazerus: Chicago Blackhawks goaltender Corey Crawford was able to practice for 20-25 minutes, a big step for him. Mark Stepneski: Dallas Stars defenseman Roman Polak is day-to-day with an upper-body injury according to head coach Jim Montgomery. Sean Shapiro: Montgomery said that Polak passed concussion protocol. No further update. The Stars are off tomorrow and practice Monday, so may find out more then. Jim Matheson: Edmonton Oilers defenseman Matt Benning missed yesterday’s game with an upper-body injury and his day-to-day. Lance Hornby: Toronto Maple Leafs forward Tyler Ennis was activated from the IR. Mike McIntyre: Winnipeg Jets defenseman Josh Morrissey returned to the lineup. Defenseman Dmitry Kulikov out with a lower-body injury.